If you and your family members recently lost an elderly loved one, it is now time to go through the probate process. One of the first matters that must be addressed is whether there is a valid will. If there is a valid will and it is admitted to the probate court, then your loved one’s estate will be distributed based on their wishes in this document. If your loved one passed away without a valid will in place, then their property will be distributed based on Florida’s intestacy laws. However, there are a number of steps a personal representative must take before any of the decedent’s property can be distributed. Gathers an accounting of the probate estate: It can take weeks or even months for the personal representative of an estate to gather information regarding all of the decedent’s real estate, personal property, bank accounts, investments, retirement accounts, and insurance policies. Ideally, this paperwork would all be organized and readily available. However, that is often not the case, and a representative needs to gain a full accounting of the decedent’s probate estate, which will be distributed by the will or Florida’s intestate law. Wraps up the decedent’s tax liability: The personal representative is responsible for filing the decedent and estate’s final income taxes. This is only possible after the representative has a full accounting of the estate’s property and final income. If there are any controversies regarding these issues, this can complicate or delay the final tax payment. Pays the estate’s creditors: Many individuals leave behind bills and debt. A representative is responsible for notifying and identifying valid creditors and then paying out these claims before any beneficiaries can receive property from the estate. If there are issues with creditors, this can hold an estate up for a while. Identifies the estate’s beneficiaries: The estate’s beneficiaries depend on a number of factors. They may be specifically stated in the will. This is how individuals can determine who does and does not receive property from their estate – no matter their familial relationship. If there is no will, then the beneficiaries are the decedent’s heirs based on Florida law. Enables partial or interim distributions to beneficiaries: In many probate matters, the beneficiaries do not receive their property until toward the end of the process. This could take months, or in highly complex situations, years. However, there are circumstances under which a personal representative of an estate can make a partial distribution to a beneficiary during the probate process. This requires that there is no controversy regarding the beneficiary’s status and there are sufficient funds. Only after taxes, creditors, and other matters are handled can a personal representative begin to distribute the estate. 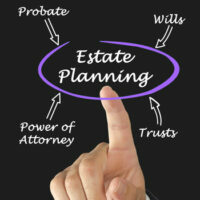 Typically, a representative will work with a probate attorney to come up with a proposed distribution plan. This is particularly important when there are many beneficiaries receiving portions of the estate. When the will or Florida law does not give an individual a specific gift, such as a predetermined vehicle, and instead gives an individual a percentage or portion, then how the estate is distributed can affect a person’s inheritance. Once the beneficiaries approve the plan, then the real estate, personal property, and money can be transferred to their new owners. Handling probate for a loved one can be complicated, particularly if many family members, friends, or charities are expecting gifts. Your best course of action is to contact an experienced Florida probate attorney from the Law Offices of Larry E. Bray, P.A at 561-571-8970 for help.